Thanks to Megan at Not Martha, I decided to make Marble thumbtacks, inspired by her Marble Magnets. This has been months in the making. Well, it hasn't taken me months to do, just months to prepare and get around to doing as I usually have 45 projects in the works. Here are the supplies. Glass marbles and round paper punch from JoAnns. Metal glue and magnets from Michael's (I made marble magnets, too). Flat headed thumbtacks from Ace hardware, and an In Style magazine for the pictures. Megan has great instructions on her site so I'm not going to reproduce them here. Though I will say that I used a round paper punch for the magazine pictures but that wouldn't work on the fabric. Trusty fabric scissors did the trick there. 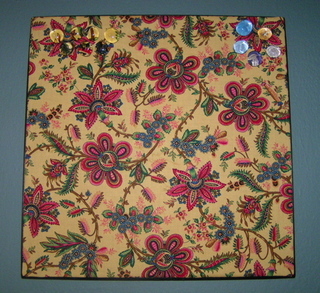 I glued pictures and fabric to a nice, thin cardstock before adhering to the magnets or thumbtacks. I don't have pictures of my magnets up as Megan's are much nicer. My glass beads are smaller than the magnets so they don't look as cool. 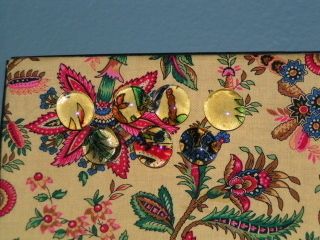 I really like the fabric covered thumbtacks as they give a neat look with matching the bulletin board itself. As for the bulletin board, I won't go into details on how I made it unless pressed. Plus, I can't really use it as I wanted as my craft room is my dining room. Jeff doesn't like cluttered bulletin boards hanging out in public and, knowing me, my bulletin board will be cluttered. So it is hanging in our small hallway above my laundry chute. I fully expect to find thumbtacks in the laundry.